Trump: Ha, Ha, Sen. Bob Corker Is Short - Joe.My.God. 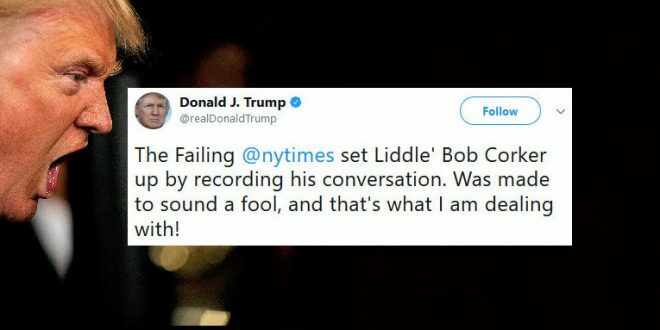 A New York Times reporter fired back Tuesday at President Trump after the president claimed the publication set up Sen. Bob Corker (R-Tenn.) by recording his conversation. Trump had tweeted earlier Tuesday that the newspaper set Corker up by recording the conversation. But New York Times reporter Jonathan Martin disputed Trump’s claim that Corker was surreptitiously recorded. “Corker had 2 aides on line, also recording, and they made sure after it ended that I was taping, too,” Martin tweeted. In the transcript of The Times’ interview, Corker says the conversation was on the record. “I understand we’re on the record. I don’t like normally talking to you on the record — I’m kidding you — but I will,” Corker says, according to a transcript of the interview on The Times. Liddle Bob Corker is probably going to be the reason you get Impeached. So keep attacking. Go right ahead Mr. ‘Liddle Hands’.